When Frank Cotton solves the mystery of a Chinese puzzle box he enters the world of the Cenobites. A world where these cruel sadists thrive on pain. Later, restored to life by the blood of his brother Larry, Frank rises to feed on the life force of others. When Larry`s wife agrees to provide the sacrifices he needs, the spills, chills and thrills are just beginning. Written and directed by the brilliant Clive Barker, Hellraiser is a film that cannot be ignored. Frank Cotton acquires a chinese puzzle box which unlocks the gates to Heaven or Hell. Frank chooses Hell and is torn apart for his troubles. Some time later, Frank`s brother, Larry, moves in with his second wife, Julia, and his daughter, Kirsty. While moving furniture, Frank catches his hand on a nail and spills blood over the floor. Somehow, Frank is resurrected and needs blood for him to be whole again. He asks Julia ( who he once had an affair with ) to help him,and she agrees. Eventually, Kirsty finds out what`s going on and runs off with the box. She opens it and unleashes the Cenobites, evil demons who thrive on pain and pleasure. They will spare her if she leads them to Frank but she also has to make sure she is not killed by either one of them first. Hellraiser is an excellent horror film for those who can stand blood and gore. 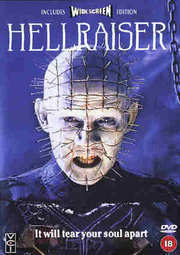 To be honest, it is not really all that gory unlike the sequel, Hellbound: Hellraiser II. It relies more on tension and shock but when there are nasty moments, they are used to good effect. The cast are very good in their roles and the special effects have mostly dated well. The best part of the film is the Cenobite leader, Pinhead ( although he is never referred to as that ), played by Doug Bradley. He steals the show with memorable lines such as " Oh, no tears please! It`s a waste of good suffering! and " We will tear your soul apart!" The other cenobites are also well done especially the ` chattering` cenobite with his endless chattering teeth. This DVD has caused a few problems for the folks at VCI. When this film was first released on Region 2, it was fullscreen and had terrible picture quality. The film was re-issued with a choice of widescreen or fullscreen but still had bad picture. This appears to be a third re-issue and is different to the other two. As I have not seen the picture quality of the previous releases, I can`t really say if there is any improvement. From what I could see, the picture is average. Some scenes come across well such as Kirsty`s first meeting with the Cenobites and outside sequences are fine. There is quite a bit of sprakle on the print and quite a bit of grain but there is probably due to the age of the film. Overall, it is far from unwatchable and is certainly better than VHS. So, an average but not terrible picture. The sound is Dolby Surround and is pretty good. The dialogue is clear as are the sound effects and the dramatic music come across well. In terms of extras, we get 4 trailers and a 6 minute featurette. This version does not have the sub-plots or photo library but this was due to certification problems at the BBFC for the sub-plots and unavailabilty to the distributors for the photo library. What we do get is good. The trailers consist of 2 theatrical versions ( one of these appears to be a teaser ) and 2 TV spots. The featurette contains behind-the-scenes footage and interviews. 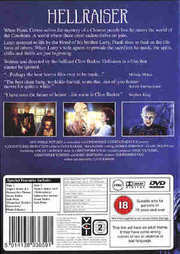 This item is quite good and contains some nice footage of the Cenobite make-up effects as well as interviews with Clive Barker, Ashley Laurence, Claire Higgins, Andrew Robinson and Bob Keen. The menus are a bit diificult to navigate if you use a DVD-ROM but if used with a normal player, there should be no problems. The main menu has a staic image of Pinhead holding the box with soundbites which appear to be from one of the trailers. Overall, this is not bad disc. There is a R1 version which is THX certified and contains a commentary from Clive Barker and Ashley Laurence and a documentary on the film. While the R2 disc is not as good as Hellbound: Hellraiser II, it is good enough. In the end, it all depends on how much of a fan you are. If you are a big fan, then get the R1 version. If, like me, you are a more casual buyer then this release is adequate enough. The transfer might not be all that great but the sound is good as are the extras so this disc is worth a purchase.